Finest Quality, hand made in Germany using a fifty step process and with a keen attention to detail, this black watch strap is made from genuine Shell Cordovan leather from the famous Chicago, USA, Horween factory. 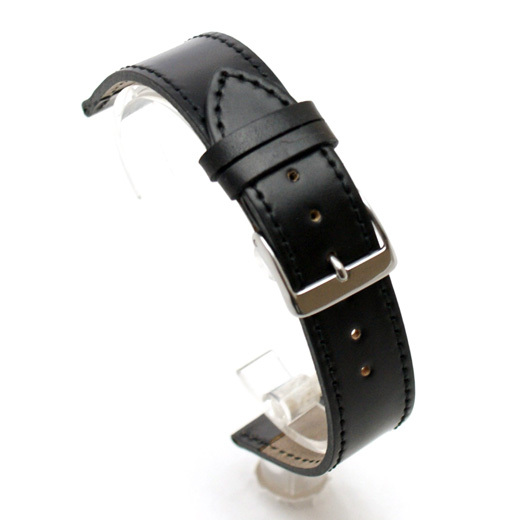 With a smooth finish and same colour detail stitching it is flat all along its length. The authentic Horween lining may feature tanning marks or sections of company stamp and the strap itself may have the odd dent or mark on it, adding to its unique look. Shell Cordovan is an equine leather made from the fibrous flat muscle (or shell) beneath the hide on the rump of the horse. The irregular oval shaped shells are tanned, stuffed, shaved, and then polished – a process taking at least six months. Each shell is slowly steeped in gentle vegetable liquors. The shells are hot stuffed then slicked onto glass frames to dry. Each shell is hand curried and shaved by highly skilled artisans to expose the shell. Dyes are hand rubbed on for a deep aniline finish. Finally, the shells are hand glazed to achieve the rich, glossy look and feel prized by fine craftsmen. Fluco are a German company founded in 1952 who produce beautiful watch straps in its workshop in the Bavarian forest town of Furth im Wald. Their watch straps are of the highest quality, handmade using a meticulous fifty-step process and lined using anti-allergic materials. 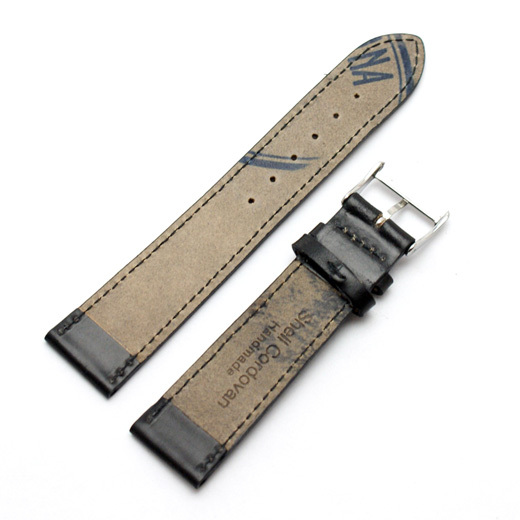 This strap will fit any watch were the distance between the lugs is 18mm or 20mm (depending on the strap you buy). Like all of our products, it is brand new and in stock in the UK, ready for our super fast shipping.